John Kelly was born a twin on 27th January 1932 in 32 Mountjoy Square, Dublin, one of six children born to Thomas and Sarah Kelly – his older brother Tommy, his twin brother Frank, and younger siblings Sally and Jim. Another sister, Carmel, died in infancy. 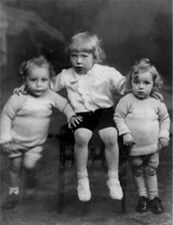 Thomas Kelly died of tuberculosis when John was 13 years old. He then left school to work as a laundry delivery boy and in the Raleigh bicycle factory. 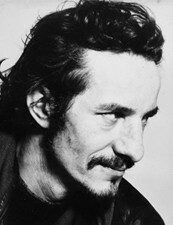 He later served his time as a house painter, studying sign writing in Bolton Street College of Technology. He recalled painting silos down at the docks with fellow sign writer Dominic Behan, brother to Brendan. He went on to enrol as a night student in the National College of Art and Design in the 1950s. John was a talented boxer and had thought of turning professional, until persuaded to concentrate on his painting by Paddy Gordon, his sign writing teacher in Bolton Street, who became a lifelong friend. He was also a keen cyclist, pedalling all the way to Rome in the early 1960s. On the return journey, John’s cycling companion drowned in a river near Avignon. The trauma of this tragic experience remained with him all his life. 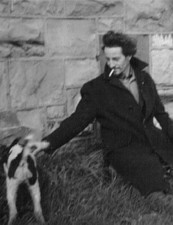 John’s first exhibition was held in the newly opened Hendriks Gallery in 1957. His first works were of a religious theme but he later said that his eyes were opened by his time in Spain, where he spent 1960-1961, travelling, painting, and living for a time with Ronnie Drew in Seville. 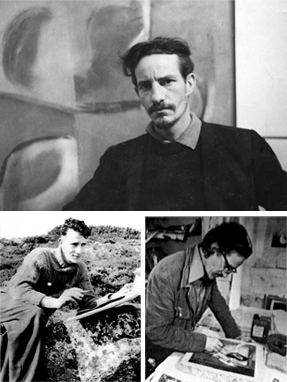 This was followed by an exhibition in the Hendriks Gallery Dublin of paintings from Spain in 1961. Around this time John also worked in London, as a house painter, and pursuing his own work; among his friends there was the artist Gerard Dillon, who joined the Graphic Studio ten years later to study etching with John. From the mid 1960s he was influenced by Abstract Impressionists, after seeing an exhibition in the Municipal Gallery, where he was first brought as a child by his father. 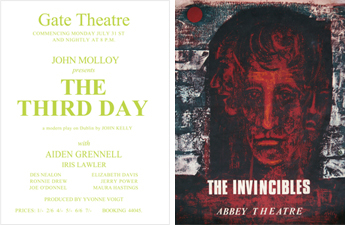 In 1961, John’s play, “The Third Day”, was performed in the Gate Theatre by a cast including John Molloy and Ronnie Drew. Although it was well received by critics, he didn’t write for the stage again, but his interest in the theatre expressed itself in other ways, designing sets, props and posters. He returned briefly to religious themes in the 1960s, designing stained glass windows for St Killian’s Church in Mullagh, Co. Cavan and for St Mary’s Church, Tamnaherin, Co. Derry. He attended a discussion group on post Vatican Two Liturgical Art chaired by his friend Austin Flannery, O.P., who commissioned cover designs from John for the publications Doctrine and Life and Spirituality. 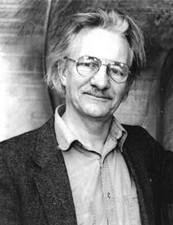 John read very widely; his interest in history inspired his exhibitions “Letters from Napoleon” and “Images of the French Revolution” and his love of literature led to many fine works such as the “Molly” series and the Yeats, Beckett and Joyce paintings in the Dublin City University collection. In 1965 John joined the Graphic Studio Dublin, becoming Director in 1972, and later was co-founder of the Black Church Studio; his skill and reputation as a printmaker led to his appointment in 1977 to the Print Department in NCAD, where he encouraged and inspired several generations of students until his retirement in 1997. John married Mairead Breslin in 1962 and they went on to have six daughters, twins Niamh and Fiona, followed by Roisin, Sorcha, Caitriona and Lara. Although John lived most of his life within a square mile of his birthplace and claimed to become nervous when away from the city, he had a great love of the outdoors, and picnics in the Dublin mountains, blackberry –picking expeditions and long walks along the banks of the RoyalCanal became part of the rich fabric of family life. 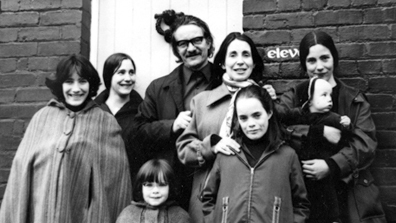 John worked in his Blessington Place mews home until the needs of his growing family made this impracticable; for several years he had a studio space over Siopa na mBróg in Capel Street with his friend Gerald Davis and in the mid-1970s he acquired a studio on the top floor of the Henrietta Street home of his friends Sé Geraghty and Alice Hanratty, a magnificent bright space with a view to the Dublin Mountains. 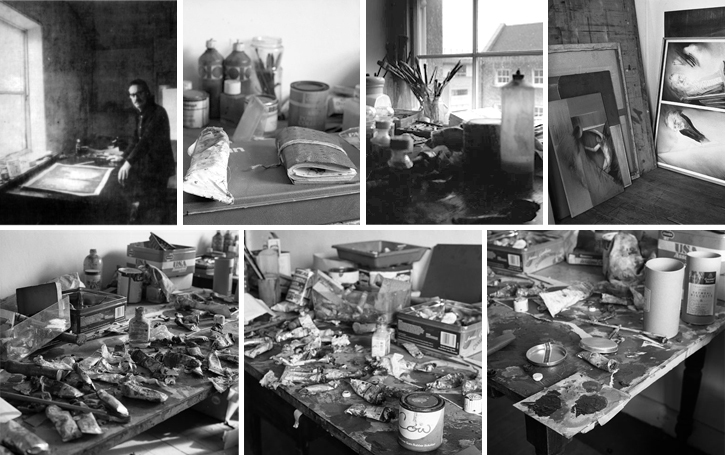 Pride of place in his studio was given to the easel which had belonged to the artist Estella Solomons, a gift from her nephew, Dr Michael Solomons. In the mid-1990s John’s was diagnosed with retinal myopathy; the gradual deterioration of his sight was a great source of anxiety and distress to him, but may have had an influence on his painting style. In April 2003 he suffered a severe heart attack, which left him with congestive heart failure. Despite his determination and philosophical attitude to his illness, he never regained sufficient strength to return to work in his top floor studio in Henrietta Street. In December 2003 he was told that medical intervention had failed and he had only a few days left to live. He faced his imminent death with great courage, producing his final art works “Drawings From the Heart Ward” in the early hours of the morning. He liked to say that he had “proved the medical profession wrong”, for he lived for over two years after this until his death in his home on March 26th 2006.